Ravelling and unravelling, I screw it up, rip it back, start over again. The first one takes forever, the next one only half of forever.Â I badger my mentors, ask stupid questions, receive patient instruction and tips. Obi Nine guides me through yet another unfathomable server labyrinth and the wool lady gives me a special needle for tucking in the ends. I feel like Iâ€™ll never get it and then I do get it, a bit. And then I forget, drop a stitch, erase the code, lose my way. Rip it back a few rows. Make a cup of tea. Start again. 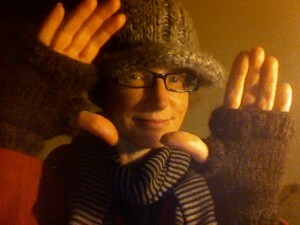 I just finally finished my first pair of fingerless mittens. Made of local sheepswool thick oily and brown. I wore them out to the woodshed to get logs for the stove, air clear and cold and the stars so bright. Next What did one Buddhist say to the other?